Visit is a one-on-one video consultation with doctors which has been featured as the next-big startup in the e-healthcare space. Visit helps you connect with a practitioner over Video at the push of a button. Request a Visit and get a callback from a top Doctor / Therapist / Coach within 30 minutes, anytime, anywhere. Visit was founded by 4 BITS Pilani alumni and has a well balanced Advisory Board consisting of eminent Business & Technology leaders from India & Silicon Valley - Alagu Periyannan (Co-founder & CTO - Blue Jeans Network, Mountain View, California), Sunil Srivastava (Ex-Director HR, Whirlpool), Pravin Tripathi (Sr. VP of International Business, Alkem Laboratories, Ltd.), Rakesh Verma (CEO & Managing Director, MapMyIndia) among others. Visit seeks to make quality healthcare easily accessible by reinventing the traditional healthcare experience. I endeavored to contribute towards enhancing this experience by working during the initial product development phase. I also helped the team with the ideation and design of their brand and marketing campaigns along with a major focus on building the UI/UX for the app. Patients are waiting days, even months, for a doctor’s appointment. Many others use urgent care OPD for minor issues. Visit takes this problem head-on by providing round the clock access to care anytime, anywhere. Faster access and lower costs do not come at the expense of quality. We use the strictest quality processes and clinical protocols for our national network of Indian board-certified physicians. There are more than 40 million Indians who suffer from emotional problems (stress, anxiety, depression and relationship issues), but never visit a psychologist due to privacy and society concerns. 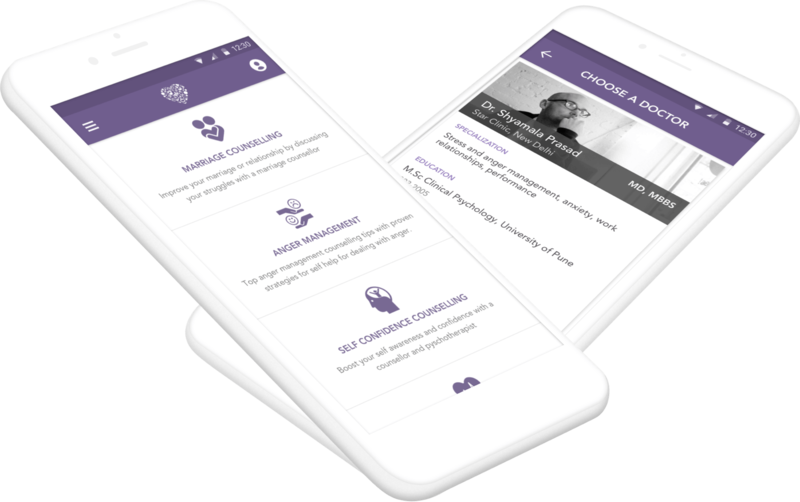 We envisioned a chat platform for patients to connect with doctors from anywhere confidentially. 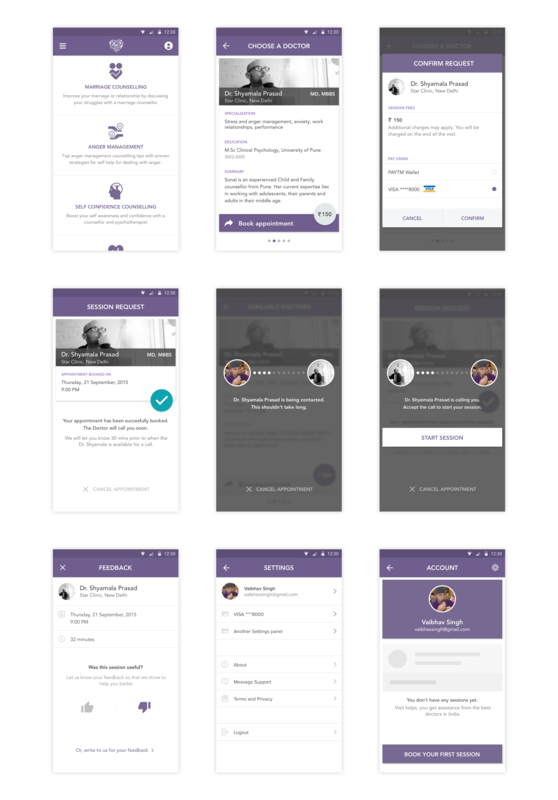 After a lot of iteration and discussions with the founders and the board team, we came up with these finalized screens for the mobile application. The prototype went through a rigorous user-test before been handed over to the developers. 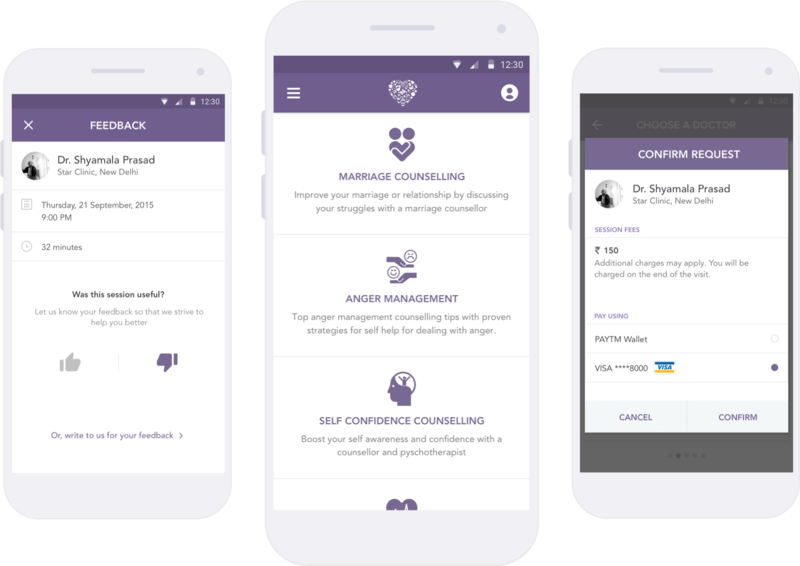 The app was launched in early months on 2016 and was were received by patients and doctors. The Visit team was able to raise a pre-Series A funding round on the basis of the traction they had created in their early days. The app had a phenomenal 4.7 ratings from 2000+ reviews.